Imagination Technologies introduces the P5600, its first 32-bit processor in the company's new line of MIPS-based Series5 "Warrior" CPUs. Imagination's PowerVR graphics are popular in the mobile graphics world but because most mobile devices use an ARM-based chip it remains to be seen whether the company can score success with an incompatible MIPS-based chip. 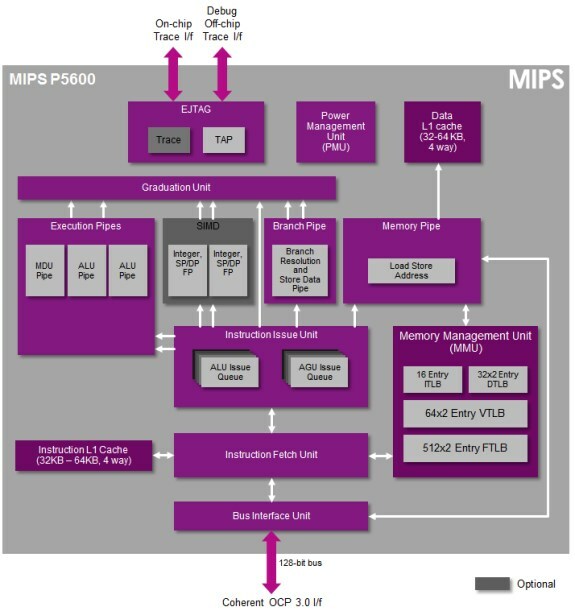 The MIPS P5600 IP core is a balanced design that uses techniques such as load/store bonding, reading registers after issue (so no reservation station logic is required), and right-sized schedulers to efficiently achieve maximum utilization of the 16-stage pipeline and its superscalar, multi-issue out-of-order microarchitecture.